Lancaster, Penn. – The Somerset Patriots (17-16, 59-44) utilized big innings early in the ballgame for the second-straight night to defeat the Lancaster Barnstormers (21-14, 59-45) 8-2 Friday night at Clipper Magazine Stadium. Click here to view the box score for tonight's game. Kyle Roller (17) started the scoring in the top of the first inning when he crushed a two-run home run far beyond the right-center field fence. Lancaster responded in the bottom of the second on Garrett Weber’s RBI double. Somerset immediately extended their lead to five with a four-run third inning. Four extra-base hits in the inning, including a two-run double from Adam Donachie and RBI doubles from Roller and Carlos Guzman provided the Patriots with their third four-run inning of the series. The Patriots added two more runs in the eighth on a Mark Minicozzi RBI single and a Scott Kelly sacrifice fly. Garrett Weber (12) topped off the scoring in the bottom of the ninth on a solo home run to center field. Guzman finished the day 3-for-5 with a pair of doubles and an RBI. Will Oliver (5-3) earned the win, tossing eight one-run innings with eight strikeouts. Jarret Leverett (7-6) took the loss after he allowed six runs on seven hits over four innings. 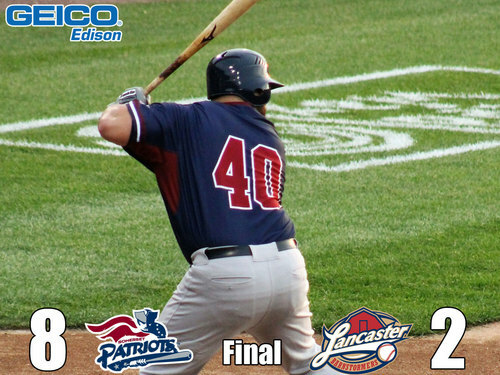 The Patriots and Barnstormers continue their series Saturday night in Lancaster. Right-hander Lucas Irvine (7-2, 3.60 ERA) takes the mound for Somerset against southpaw Rommie Lewis (6-9, 5.29 ERA) for the Barnstormers. First pitch at Clipper Magazine Stadium is scheduled for 6:30 pm.